Wednesday, Nov. 28, 2018, 6:30 – 8:30 p.m. 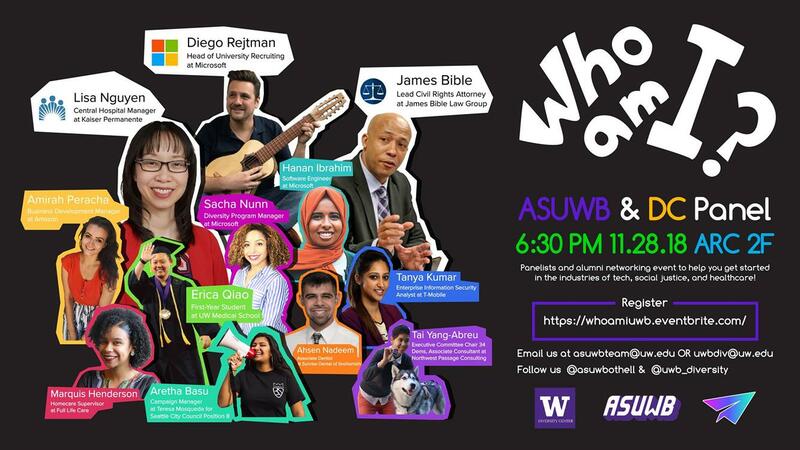 The Associated Students of the University of Washington Bothell (ASUWB) and UWB's Diversity Center will be hosting a fall quarter event called “Who am I?” on Wednesday, November 28th from 6:30pm-8:30pm in the ARC 2nd Floor. This is a FREE event!!! This event is the first of a three-part “On My Way” series to help students set themselves up for success by embracing what they bring to the table and providing an avenue to engage with different industries in their exploration of personal values and interests. This series of programs will also highlight the importance of looking at social identity(s) as a strength and a valuable element to developing professional aspirations and connections. We have three main speakers who will be sharing their "windy road" TedTalk inspired story. After, we have 9-10 UWB and UW Alumni returning to our campus to join the speakers for a Q&A and Roundtable Networking Mixer. Companies and organizations that are represented: Microsoft, T-Mobile, Kaiser Permanente, James Bible Law Group, City of Seattle, Amazon, UW Medicine, UW Pharmacy, Full Life Care, Northwest Passage Consulting, Sunrise Dental of Snohomish, and Dropbox. This is a free event open to our husky community, feel free to dress casually! Please RSVP on Facebook and/or Eventbrite so we can account the number of individuals attending *this is not a requirement to attend. At the event, we will have light refreshments, a photo booth, and the opportunity for you to network with our panelist, ASUWB team, Diversity Center, and Career Services. If you have any further questions, please reach out to asuwbteam@uw.edu or uwbdiv@uw.edu.